WHAT YOU SELL THE HUNT FOR AT A FUNDRAIZER IS THEREFORE ALL YOURS! 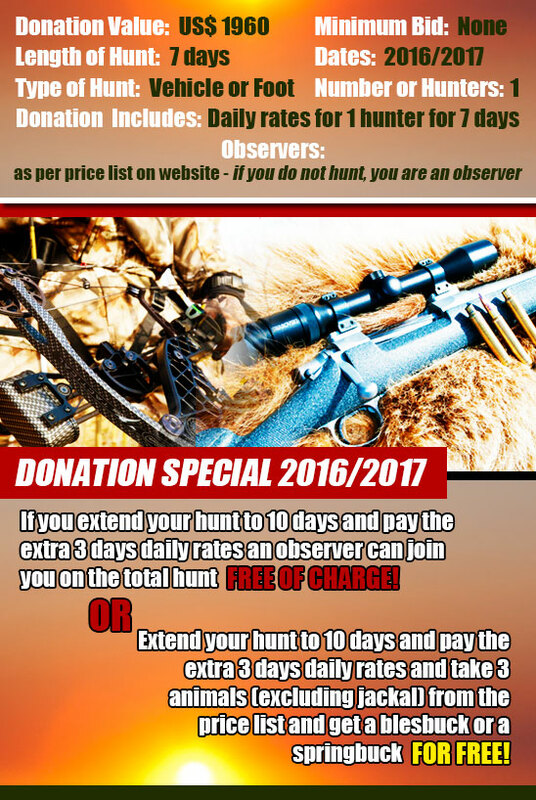 Daily rates – Service of professional hunter – Service of professional trackers and skinners – Ground transportation – Accommodation – Meals and daily laundry – Pick up and return to Kimberley airport – One free trip to Kimberley, the diamond city for shopping and sight seeing. Packing and dipping and dispatching of trophies and taxidermy work if applicable – Air charter and hotel cost before and after safari – Liquor and cigarettes – V.A.T on daily rates (where applicable). All trophy fees not included. Hunt: Rifle and bow hunting is welcome.